What happened to my strength and mass during10 weeks of travel in Ecuador and Peru? I went from averaging 199.4lbs, 16.8% fat to 175.1, 16.6% fat on the same bio-impedance scale. While this scale may not be accurate as to my true body fat %, I had conducted five repeated pre-trip measurements and found it was quite reliable. I neglected my resistance training. Finding a place to do any resistance training was far more difficult than I had imagined. 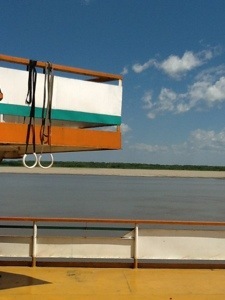 Clean, flat surfaces were exceedingly rare in the Amazon. The amount of mental effort and time required to take care of ourselves while traveling was much greater than expected. Navigating from place to place and finding somewhere to eat, sleep and bathe was far more time consuming than I had anticipated. Biking for 8-10 hours a day left little enthusiasm for resistance training. Did I mention I had five cases of traveler’s diarrhea the last several of which were caused by giardia? Actually we did train for one week. In the total of 10 weeks of travel, Jessica and I had two weeks of regular resistance training. 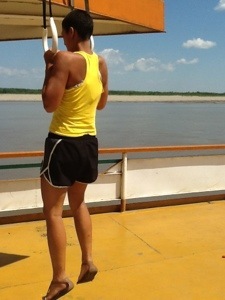 Jessica rocking the pullups on the rings we set up on the boat. 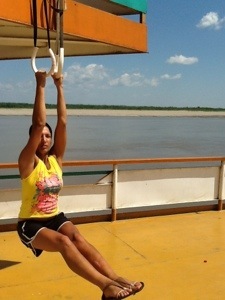 Coming after a month without resistance training, our workouts on the boat made us were incredibly sore. This wouldn’t have been a big deal if we weren’t about to get on a tandem bicycle and climb up the Andes. I way overdid it on the nordic hamstrings drops, an exercise designed to damage the hamstrings. This made the first 4 days of the bike trip unnecessarily painful and slow. Future Note: Don’t get your legs really sore before a bicycle tour with lots of climbing. Its far less fun than it sounds. Work on handstands whenever there is a flat, relatively clean surface. FAILED. The flat, relatively clean surface never materialized. Take 10 steps on slackline ACHIEVED! Strength is a function of relationship; one has to ask himself what resources is he using, how are they being used, and at what intensity are they being used to accomplish whatever goals he has in mind. the more a person understands kinesteticaly what it is that he is really engaging; he wont be able to fully integrate those parts into a function; and if one does not differenciate function and able to lower intensity at the same time, he wont be able to further differenciate and integrate new relationships into his total movement which might be more supportive in nature. For example; if a person were to sit down with one leg bent and internally rotated, and the other with the leg straight out outstretched, and if he were to try to inch his way forwards using only his sit bones, it would take quite some training for the person to learn how to integrate, which mostly come from inhibition of uneccessary muscular contraction, for him to be able to walk. He would have to learn to inhibit his large quads, his hamstrings, many of his gluteal muscles, and then learn to syncronzie his internal pelvis muscles in such a way that he can create a movement: the feeling of such a movement will varey from person to person because you dont know how the momentum is being transferred; there are too many variables, but you will be able to quantify progress by how comfortabely the person can initiate movement and sustain it which lies upon the least amount of energy expedenture possible. another example; singing, a person who sings needs to learn to inhibit muscular contractions in his throat while increasing intesity and reorganizational skills of the diaphram, rib cage muscles, and pelvis floor which the ends result is a more resonant tone. I dont think you got “weaker” I just think your body had underwernt some vital reorginizations for self healing, diverting its resources from external functions to internal ones…you might have recieved some internal support in the form of new fascial connections within your internal organs and viscera which would support your internal core structure, and now you will probably get even “stronger”. 🙂 be able to move more weight.